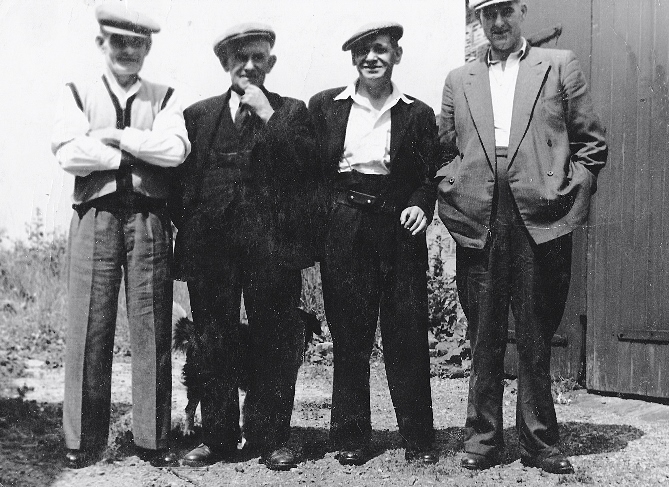 Tommy Hollis (third from the left) with friends on the allotments near the Airedales in the 1950s. The tall man on the right was called Westmoreland. Apart from a few years when she was in Germany with her soldier husband Margaret Bunt has lived all her life in Oulton and Woodlesford. The youngest of three girls and two boys she was born at a maternity hospital on Hyde Terrace in Leeds and christened on the day war broke out in 1939. Until her marriage she lived in one of the small stone terraced houses on Airedale View behind the Woodlesford co-op which were built in the 1890s. Since 1966 her home has been in a council built house on Holmsley Field Lane. Margaret’s father was Tommy Hollis, a miner at Water Haigh colliery until his retirement in 1965. He was born in 1900 at Houghton-le-Spring half way between Durham and Sunderland. His father and three older brothers were miners at Lambton and Hetton’s Houghton colliery. His grandfather Hollis was born at Barrowby in Lincolnshire and had gone north working first as a tile maker in Bishop Auckland then as a miner at a pit near the village of Shotton Colliery. Probably because of similar difficulties in getting a mining job in the hard times after the First World War Tommy joined the army and was posted to the King’s Own Scottish Borderers. He was based at Redford Barracks in the Edinburgh suburbs and had been promoted to corporal when he married Margaret’s mother, laundry maid Margaret Urquhart in 1924. After he left the army Tommy still found it hard to get permanent work. His sister was married to a pit deputy who had already moved south to live in Hunslet and it was on their advice that Tommy joined many other out of work “Geordie” pitmen who migrated to Yorkshire during, or just after, the 6 month miners’ strike in 1926. Like many of his generation Tommy liked to be outdoors when he wasn’t down the pit or in the pub. 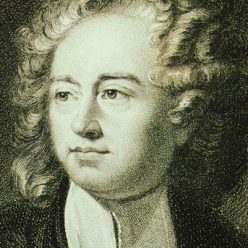 He kept pigeons on an allotment and canaries in the attic. Along with friends and a collie dog he loved to go “rabbiting” with a ferret, although on one occasion when they were poaching on the Temple Newsam estate the appearance of a ghostly couple gave them all a bit of a fright – an experience they often recounted to one another. For a few years after he retired Tommy served as the “lollipop man” for Woodlesford school. Margaret remembered that when she was young her father was a regular at the Two Pointers and every year they went on a coach trip to Belle Vue zoo in Manchester organised from the pub. When he came home from a session the family could tell if father was in a good mood if his cap was at a rakish angle. “You always knew what mood he were in because of the tilt of his cap when he came through t’ door,” Margaret said. After leaving school Margaret Hollis worked at Waddington’s printing works in Stourton packing “Colgate” toothpaste cartons. Later she moved to C&A on Boar Lane in Leeds. As a teenager she went dancing at Mark Altman’s Empress Ballroom on Great George Street in Leeds and to the Kiosk at Castleford. Margaret met her future husband whilst she was visiting relatives in Edinburgh when she was 17 years old. Like her father John Bunt, a piper in the Black Watch (Royal Highland Regiment), was based at Redford Barracks. They married at Woodlesford church two years later. Their first son was born in Yorkshire after which Margaret followed John to Cyprus and then Germany. They returned to live locally in 1966 after John, as a retiring soldier, was given housing priority by the Rothwell Urban District Council. Frustrated with a succession of jobs he too became a miner, starting at Lofthouse colliery in 1974 a year after the disaster there. Click on the link below to hear Margaret Bunt’s memories of her father and life on the Airedales in the 1940s and 1950s. 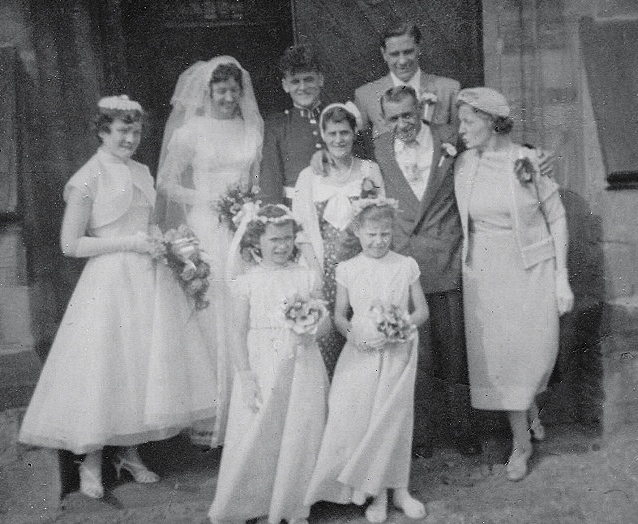 Margaret Hollis’s wedding to John Bunt at Woodlesford church in 1958. Also in the picture are her brother Terry, her mum and dad and John’s mother. The bridesmaids were her nieces, Sandra Wilkinson, Carol Knowles and Pat Hollis. 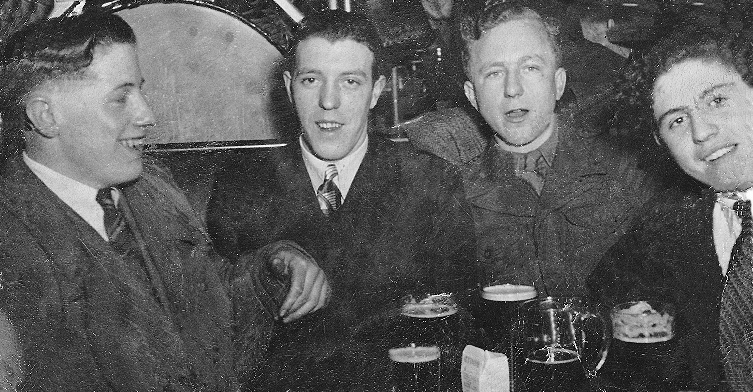 Likely lads in a local pub in the 1950s. Left to right: Terry Hollis, Dave Falkingham, Unknown, Louis Abbey.